NOTE: I’m NOT an expert, this is simply my personal experience. Now before we dive in, let’s discuss a few hot topics. 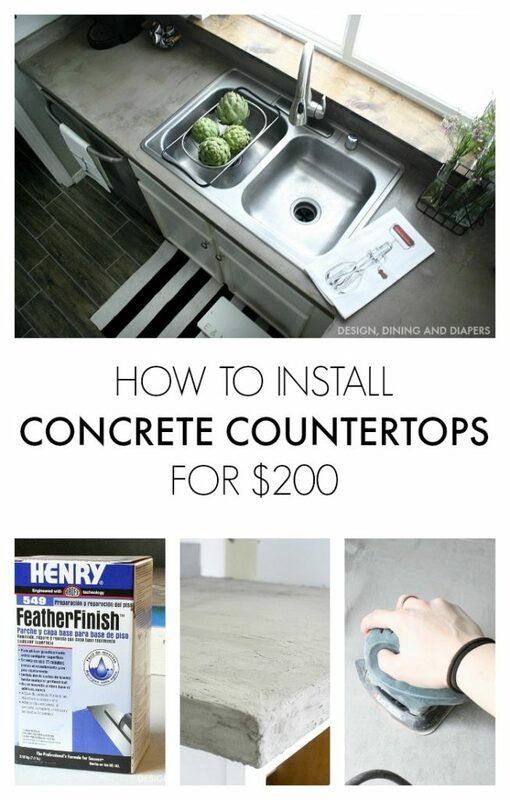 The total cost for my entire kitchen (plus bathroom) countertops was just $200! It’s messy. Like really messy. Would I do it again? YES. How hard is it? ANYONE CAN DO THIS. Is it a lot of work? YES. Ok now that we got that out of the way, I’m going to share some tips and tricks I learned along the way. I first discovered this technique when I stumbled up this post from Kara Paslay Designs a few years ago. I’ll admit, I was super intimidated when I first read it, I hadn’t seen it done anywhere else and I just tucked the idea away. And then a friend of mine actually did her kitchen using it and after seeing her countertops and talking through the process it motivated me to do my own. I did a trial run on my bathroom back in October and I definitely learned from my experience (we’ll chat more about that later) and decided to do my kitchen with a few changes. And I’m SO SO happy I Did. Like any project, prep work is involved. 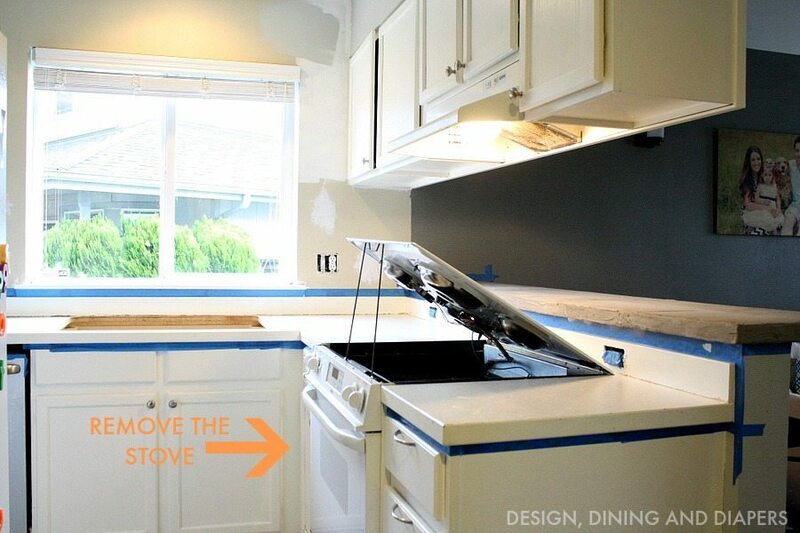 Clean off your counters, remove the sink and REMOVE THE STOVE. I didn’t remove the stove and attempted to work around it. FAIL. When we removed our old appliances, part of the countertop chipped off and I had to repair it. Thankfully these countertops are SO easy to fix so it wasn’t a huge issue but I would remove the stove to prevent any problems. Taping. Ok. Here is the deal. Definitely tape under the countertops to protect the cabinets but I have mixed feelings about taking around the edges. It did help but once the concrete dried it was hard to remove the tape and again, parts chipped off. If I were to do this again, I may try just being really careful with the trowel and wiping the walls down as I go. On the bright side, the concrete actually washes off the walls really easily even after it dries. I would also suggest covering your floors, especially if you have nice ones because this stuff is messy. Really messy. Using a 2:1 ratio of powder to water, mix your first batch. I found that a batch of 4 cups concrete to 2 cups of water was the perfect amount to work with at a time. Mixing the concrete is very similar to mixing thin set or grout when tiling. You just want a good peanut butter consistency. TIP: If you wait more than 20 minutes to mix a new batch, throughly clean out your bucket or get a new one. I ended up getting a bunch of plastic bins at the Dollar Tree because I had limited chunks of time to work on these and if I left my container for too long and then mixed another batch in the same container, huge chunks of concrete will break off and get in your batch. So I generally just tossed the container once I was done working for that time period. Using a flat trowel, apply the concert to the laminate countertop. My first coat was always pretty rough and uneven. The left shows the concrete right after I applied it. And the right is about an hour after. You can see how it’s starting to lighten and harden. 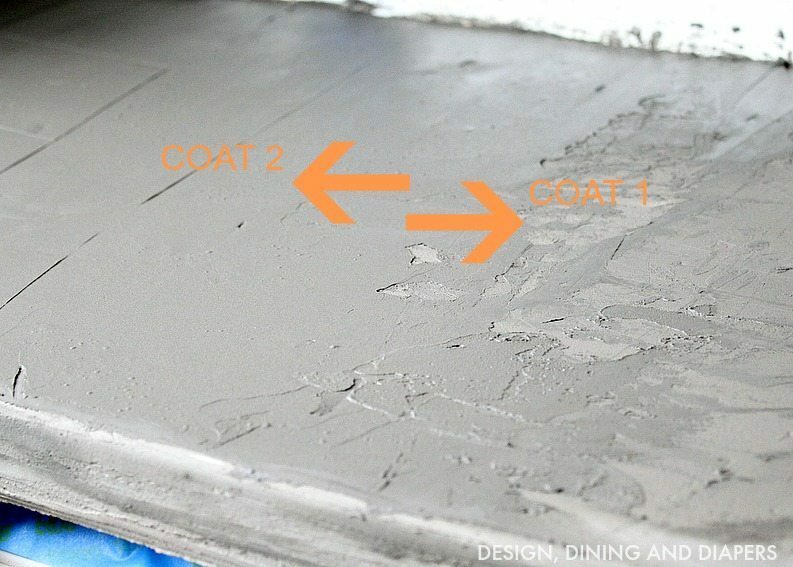 TIP: Applying concrete to the edges can be tricky. I found that waiting until the concrete hardened a bit helped and I ended up using my hands instead of the trowel. I decided to apply thick layers with my hands knowing I could sand them down later. TIP: Be sure to periodically clean your trowel. If the concrete dries on the trowel, you’ll start to notice marks in the concrete as you apply it. As you can see, as I applied each layer it got smoother and smoother. TIP: I waited until the first few layers of concrete started to dry before doing the backsplash piece. If you do it when it’s wet, the trowel with remove what you just applied on the counter. Here is what my countertops looked like prior to sanding. They are not perfect and pretty rough in some areas. Getting around the outlets was tough. Again, it was hard to maneuver a trowel so I used my hands and sanded down later. Just be careful not to apply too much concrete over the outlet screws (I had to chip some away) because you’ll need to pull those out 1/4″ before putting the covers back on due to the increased thickness of the counters. In case you missed my bold statement above, sanding and sealing the countertops are THE most important part of the process. And just to give you a heads up, I sanded for easily 5-7 hours. I wanted my countertops to be as smooth as possible so I worked really hard at sanding. Of course there are still imperfections which adds to the beauty, but I wanted them really smooth to touch. It gets really dusty, so I suggest taping off the area with a tarp and wearing a mask. 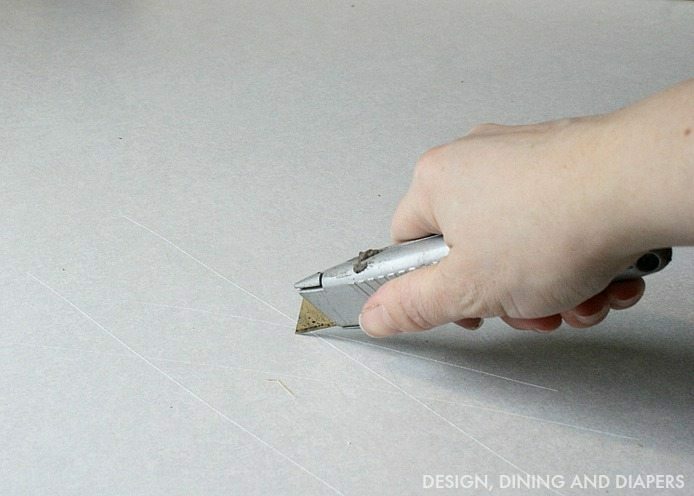 Start with 50 grit paper to sand down really rough spots, but don’t do much more than that. 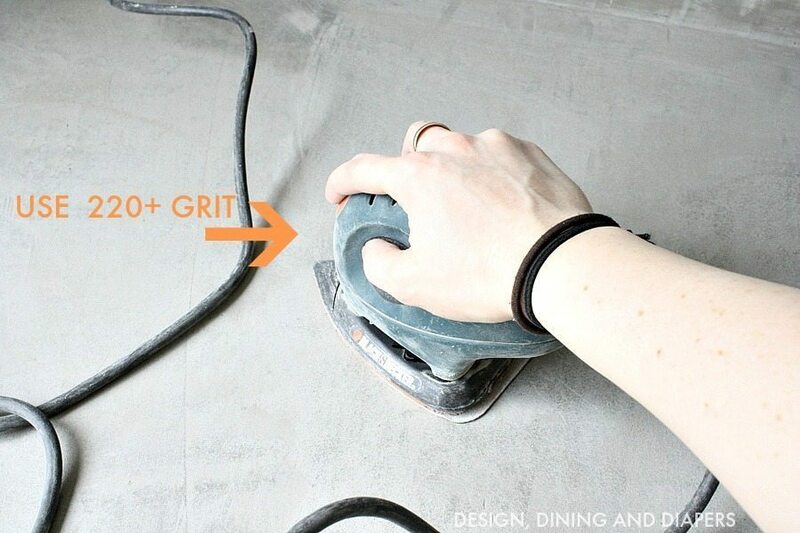 The 50 grit will remove more of your countertops than you want and may cause some of the edges to pop through. Quickly switch to a 220 grit because this will give you that really smooth finish. Now sand. Keep sanding and sanding and sanding. 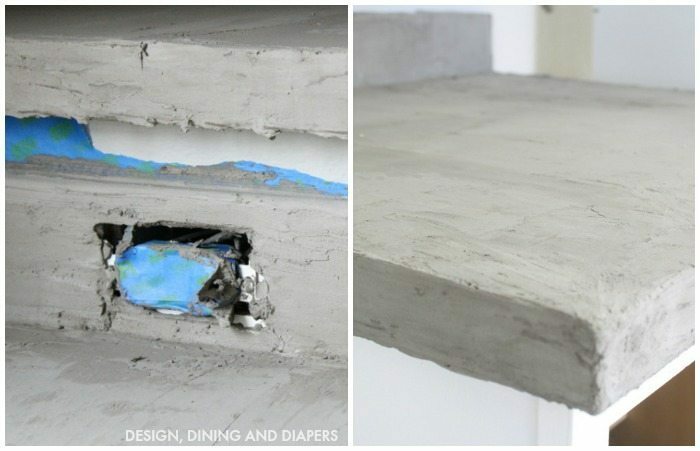 If you start to see parts of the counter top pop through, don’t stress too much because you can always go back and touch them up with more concrete. That’s the beauty of working with this stuff. It’s pretty fool proof because you can reapply it. Here is what mine looked like close up. You’ll want to vacuum periodically to remove the dust and see the countertops better. Sealing the countertops is a huge deal. This is a make or break decision. Concrete countertops are really porous and stain really easily. I waited a few days to seal ours and we used our stove and the oil stained the countertops. Thankfully I could fix it by sanding and applying more concrete! But seriously, the right sealer is really important. Ok. Anyway I did A LOT of research on this topic because I didn’t like how our bathroom turned out and I HIGHLY RECOMMEND going with a Water Based Acrylic Concrete Sealer. The Acrylic part is key. This leaves a hard finish and really protects the surface. Here is a chart I put together to help understand the difference between the two sealers I used in the bathroom and kitchen. *Note. I’m not an expert, this is just my experience. Also note, neither of these sealers are certified food safe. The only concrete sealer I found that was certified food safe was not acrylic, had horrible reviews and was not the look I was going for. I never put my food directly on my counters and eat it, so this didn’t bother me. PLUS, the wax you end with IS food safe. I’m going to be sanding down our bathroom vanity and resealing it. 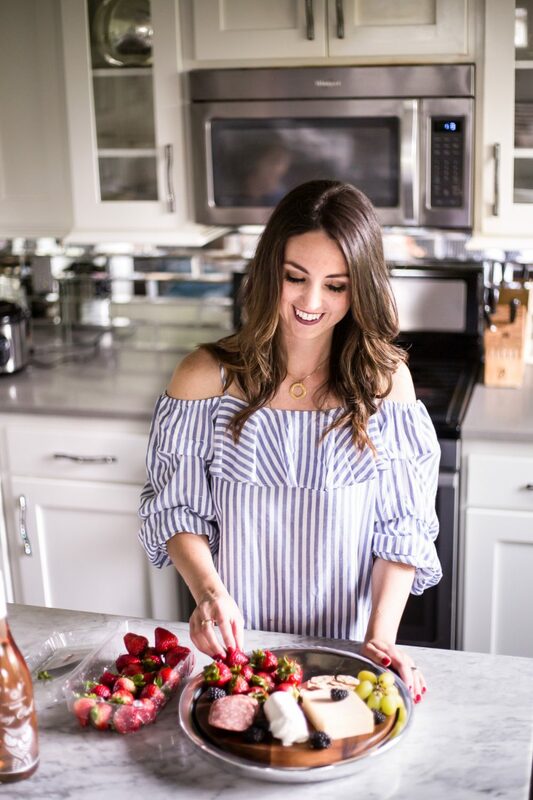 So when is it safe to seal your countertops? A really knowledgable guy at the hardware store taught me a trick. He said that I didn’t necessarily have to wait the full 30 days to seal (like it says on the back of the can), I just needed to wait until all the moisture was out. SO. He suggested that I tape a square of plastic wrap down and wait 24 hours and if no moisture appeared I was good to go. I used this Water-Based Acrylic Sealer in Satin and I loved how it turned out. I’d do it again in a heart beat. The countertops are going to get really dark when you apply your first layer, but it doesn’t take long for them to lighten up a bit (they will still keep a wet look). You can see some of those darker areas in the picture above, those are areas that must have missed the first coat. I did 3 coats of sealer. On the third coat I didn’t see any of those dark spots which mean the entire countertop had been sealed! Last step! I used Cheng Concrete Wax, which is food safe. I bought this little buffing kit that came with a drill bit attachment and did an entire coat. Note: You’ll need to wax your counters every 6 months. When cleaning your counters you have to use a non-acidic cleaner or else it could potentially stain your countertops. I found this one at Lowes and so far it is working great! Are they durable longterm? I’m not an expert on this, BUT, I think these are a fabulous inexpensive fix but I don’t see them being a good longterm solution (thinking 10+ years). And my opinion is based primarily on the fact that they can stain easily. That’s just my opinion. I still love them though. Can you place hot things on them? I actually don’t know and I haven’t tried. Would I do them again if we moved? YES. In the right house I would. How have they been holding up?! We moved out of the house about 8 months after we finished the countertops. During the time they held up great, you just have to be careful with oils. If you have any additional questions please let me know! I’d be happy to help. $200?? You are a rockstar! 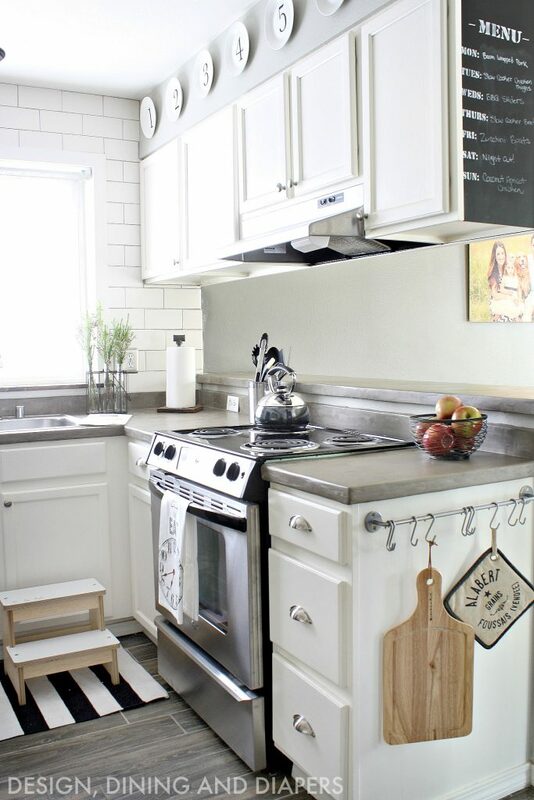 What a great, inexpensive solution for getting that beautiful kitchen you dreamed of! This is gorgeous you did an amazing job! I love this so much you have me rethinking the white marble I’ve wanted for years! Pinning and sharing! I have wanted marble too. I’m wondering if you could acid stain these. With the right colors, I think we could get close! These look great and I love the price. 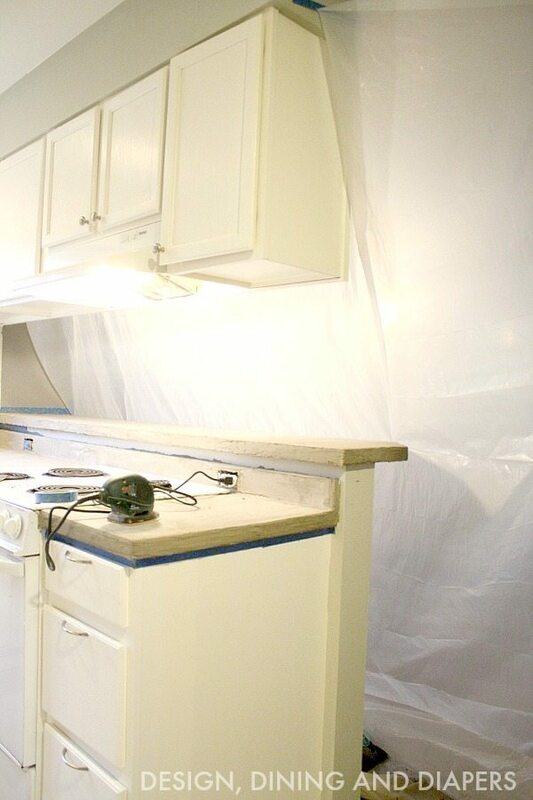 My counter tops are older and I wanted to do something with them until I was ready to replace them but if this turns out well I can save the money from replacement and spend it on a nice trip! Thank you for sharing. I tried to read a lot of the other questions so I hope I am not duplicating. I see that you have since moved. How long were you in the home after refinishing your countertops. I’m wondering how long they hold up before cracking or chipping. Also, has anyone tried to “acid stain” these to have that marble look? If you haven’t tried to stain does anyone see any reason why it wouldn’t work? Thank you for your thoughts. I am so excited to try this!!! Such great information. I’ve been thinking of doing this on my countertops but the time and mess have made me rethink. How did you get all this done with your little kiddos? They are so beautiful! Love how it all looks! I love these! I’m wondering how they would work over wood? I may just try it out and see! Thank you for sharing. Countertops look lovely..perfect solution for that 80’s laminate. I too have oak cabinets and I am thinking of painting them..were yours sprayed? do you have another post showing how you did this? I am definitely a follower from now on..
I’m literally in the process of making my own concrete counter tops, took a break to hit up facebook, and saw this post! It was meant to be!. I’m doing pre-cast, but I still haven’t found a good sealer or wax. Definitely looking the ones you used up. Pinned for sure! Perfect timing :) I highly recommend a water-based acrylic sealer! I can’t wait to see yours ! 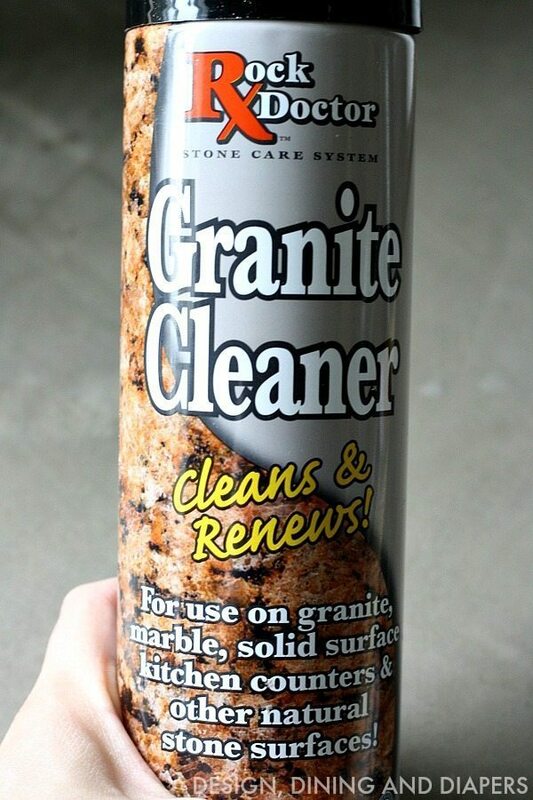 Your countertops look amazing. Really great job. I did cast concrete counters because I wanted to add some color in to the concrete, Can you add color into the concrete with this method? This looks like it would have been a lot easier. Probably faster too, but the sanding, WOW, that looks like a lot of sanding and dust. I use the Cheng wax too. 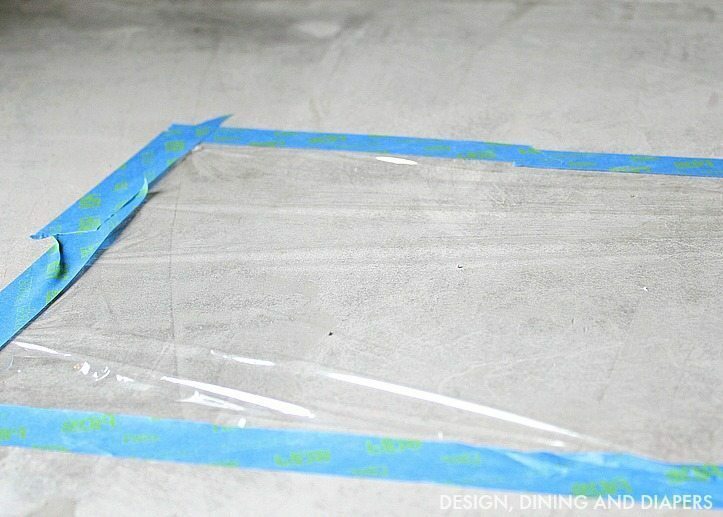 They also have a really great food-safe acrylic concrete countertop sealer. You might want to look into it for your next project. I found it really easy to use. Thanks Dennis! Yes you can apply a stain directly on top the concrete before you seal them. I chose not to because I wanted the original color. Yes, the sanding was A LOT of work. But worth it and it just depends how smooth of an application you can get in the first place. I looked into the Cheng sealer but heard so many mixed reviews that I decided against it. It’s good to hear your experience with ti! I just found out that ardex brand feather finish comes in white. Which is the only color variance I have ever heard of. I do know people have had problems with cracking over time because they have tried to add things to it to change the color which is not a good idea. If one wants to change the color I would maybe suggest a tint or stain added after the final coat of feather finish and before the final clear coat but I would try it on a sample piece first a few times. I was going to try that….I wanted the counters to be almost grey brown and antiqued in areas-so I was going to maybe try to mix a few drops of grey dark brownish black acrylic paint in with the clear coat I was going to put on and maybe add more to get the color right to tint it correctly and do the rest of the sealing with the regular concrete sealer later-I haven’t decided. Gotta do more research to see if that’s even worth it to do all that-probably going to end up doing the concrete, doing the tinted color layer with a plain old interior polyeurithane satin clear coat, and then doing a few regular coats of clear coats of the poly and just stopping it there, I don’t want wax on my counter, it’s odd to me. I’ll do more research. 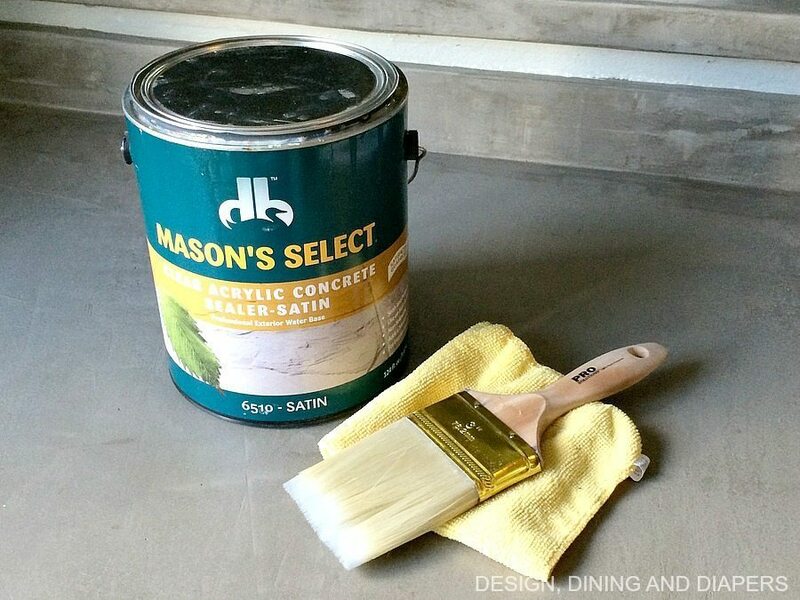 I used to use this clear coat paint tinting technique often with decoupage and antiquing furniture and various applications but I know you can’t really add any actual tint to the feather finish concrete mix itself and adding anything to it does effect its integrity a lot. It is cool that it is available in white. Good luck with your projects everybody!!!!! There is a powder you can add to change the colour – ask them at your concrete supply store. I saw another countertop that used two parts ardex to one part powder to get black, but I personally mixed a very little bit of red powder (1:32) to get a terra cotta look. I was going to use a water based stain but it was $100/litre whereas the powder was about $7 and I have a ton left over. I also did NO SANDING whatsoever. How? After the second coat had dried for about three hours I went back and with oft wetted hands I smoothed out the surface. It is a handmade look, not perfectly flat, but beautiful. allowing me to build up the finish quickly. It was called Vocomp30. Question for anyone who has done this: If you take your fingernail and press it into the Ardex, does it mark? It does on my countertop, which suggests the Ardex is not as hard as concrete. You’ve inspired me! I’ve also seen it done and thought ‘forget it, too much work’. Question 1: how did you estimate how much concrete you needed by square foot of surface? Question 2: what was the drying time between coats and sanding? I know you spread out te project over time but if we were to do this ‘weekend warrior’ style how much do you think we could get done excluding the sealing process of course. Hi Johanna! It’s definitely worth the work if you are looking for an inexpensive fix! And I love how they look. 1) After doing my bathroom I realized that it doesn’t take a lot of masonry concrete to do the job. I used about 3 boxes in my kitchen so if you look at the full reveal that will give you an idea. It’s only about 1/4″ thick 2) By the time I was done applying 1 coat to the entire kitchen, the concrete was dry enough to cover again. I did mine over a few days purely because of time constraints. I would definitely wait at least 24+ hours to do the final sanding. If the concrete isn’t dry enough it will sand off too easily. It needs to fully dry in my opinion. I think you could get it done in an entire weekend minus the sealing. The application process is pretty fast, the sanding takes up a lot of the time. I’m guessing you removed your sink when you did the countertops? It looks awesome and as I’m trying to get a full plan in place to update my kitchen I think this could be the perfect contertop solution! I cannot believe how fabulous they look! I’m sure all that sanding was a pain in the behind, but it looks like it was so worth it! Hello! I am getting ready to begin the sealing process on my Ardex countertops. I know that it has only been a couple weeks since you finished the project, but I wanted to see how your sealer working. Have you had any issues with grease or coloring stains? Also, do you think that the waxing step could have been skipped or was it necessary? Hi Erin! I actually finished these back in February. It just took a while to get the post up. They are holding up great. I really like the sealer that we used. With that said, oil can still stain them. When wiped off quickly it’s not a problem, but when left on too long I’ve noticed a few spots darkening. It’s not super obvious though since the countertops are rustic anyway. I haven’t noticed any other stains though from colors. I would definitely wax. It adds an extra layer of protection and makes them really smooth. I wouldn’t skip this step. Waxing should be done every 6 months. They turned out gorgeous ! Not sure if I could do this as well as you did – but wow just love the results ! Thanks so much for this! It looks amazing! I had been thinking about doing butcher block countertops next year, but I’ve also heard you can stain this kind to look like butcher block. I definitely want to try it now that you’ve convinced me! Hi, these came out beautiful! Do you know if you can do this over tile? Also, do you know if can be used as a backsplash too? Thanks so much! I would not suggest going over tile. As for a backsplash, you definitely could do the concrete as a backsplash! Just make sure to really seal and wax it because cooking oils can stain the concrete when left on too long. 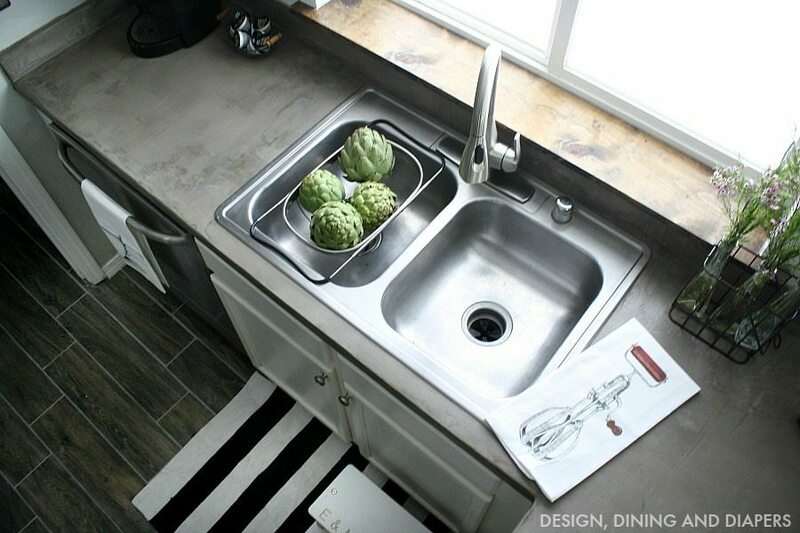 Your countertops look fantastic….got my Ardex and will start small with my bathroom countertop. Just wondering if you sanded between each coat or just applied the coats and did the sanding at the end? Love this post! I work for ARDEX and it’s wonderful to see one of our products used in a non-commercial application! Great job! You’ve inspired ME! Thank you Sharon! 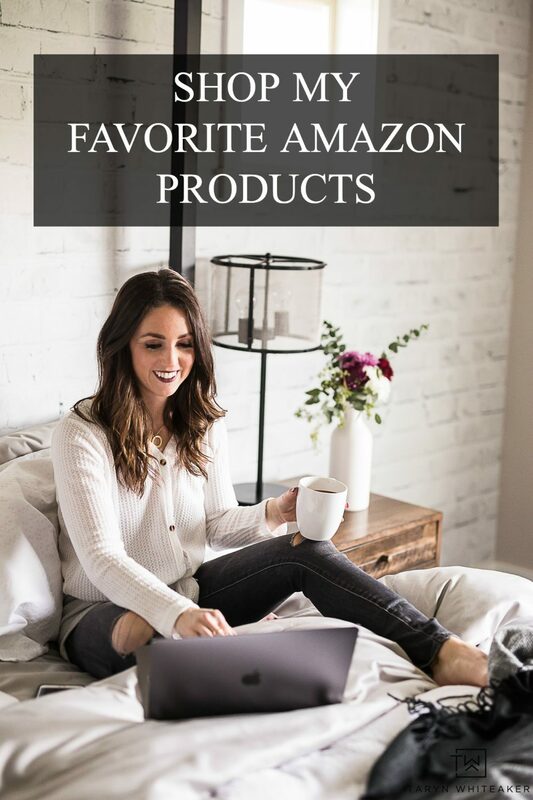 The product was so great to work with! Great instructions, very clear. I’d like to do this on my island. It has 4in tiles now and the bumps and grout don’t make a very good workspace. I was ready to go until I saw your response about tile. What problems do you think I would have using this over tile? I did my countertops with Ardex about 3 years ago and they are holding up great! I have re-sealed them once. I don’t have any trouble with staining. I have since done my friends tile countertops and her full tile backsplash and it turned out great! It takes a lot more concrete to fill in the grout lines but they are holding up great as well. I sealed them with many coats of sealer. I have only had to make one repair because I dropped a huge bowl from the top shelf of my cabinet. You can’t even tell where I repaired it, so easy to fix! Yours look great! Our current laminate countertops are horrible (and pink!!). We have been in our house 10 years and are looking for a quick and inexpensive fix. On the lip of the cabinets some of the laminate is cracking. Think you could still use it as a base? If not could you use your same method and use cement board underneath? I bet you would have to build a frame then. Just wondering how perfect you think your base has to be. This is awesome by the way! My husband and I are huge diyers. One question I do have, sorry if you already answered it, did your countertops have rounded edges or the square edge already? Thanks! They were square already. Hello there!!!! Just wanted to say this turned put amazing!!!!! ;) love them!! I’m in the process of doing our bathroom and kitchen and wanted to know if you sanded between coats or just after the 3rd coat!? ;) Also how did you hang the white plates with the numbers!? Are they plastic white plates or glass and did you add the numbers!? ;) Thank you!!!! PS your while house tour was awesome!! Great style!!! Hi Kimi! I just responded to your plate question, but they are ceramic plates from the Dollar Tree and i added Vinyl Numbers. For the countertops, I only sanded after the third coat, but looking back I might do some light sanding in between each coat. The final sanding process will still take a long time. How long does it take you to reapply the wax? How long does it take for the wax to seal? Do you need to reapply the sealant if you use wax too? Hi Dave – It took me about 20 minutes to apply the wax, and you can see my full counter space in the pics. Since you buff the wax as you apply it, there is no need to wait to use the countertops. And no, you won’t need to reseal them again. The only upkeep is waxing every 6 months or so. Hi, I think these counter tops look amazing!! I have been wanting to try this now for months I just have one question, Can you add some color to them maybe make them a little darker?? I just redid my cabinets and I am wanting something a little darker!! Hi Jessica! Yes! 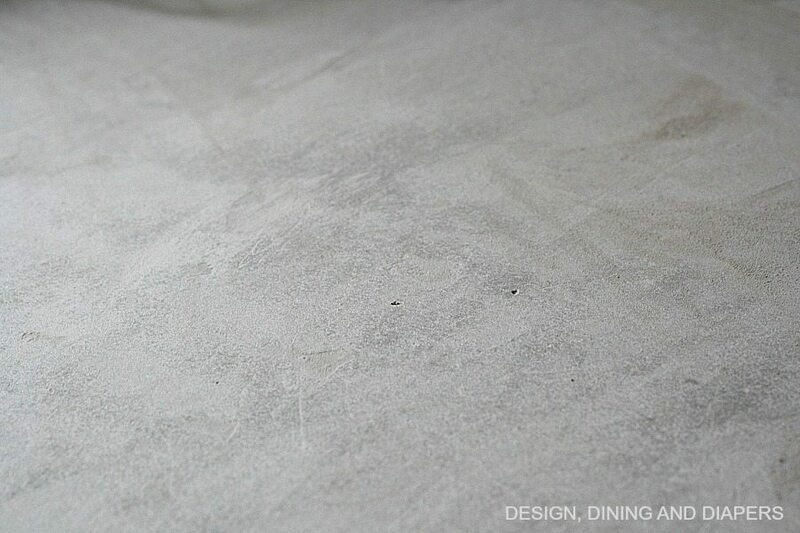 You can stain concrete. You would do this after you sand them and before you seal them. I had a friend do a brown/gray mix and it turned out beautiful. What brand stain do you recommend. I want to do mine as well but would like some color. I looked into a powder stain that you mix with the ardex before you add water but it makes me nervous! Does your friend have pics of her counter? I’d love to see a stained ardex counter! Hey! Sorry I don’t have pics, but I know she used an actual concrete stain from Home Depot, one that is used for driveways, etc. And she did a custom color mixing some of the stains. Awesome! Thanks for the tip and quick reply. I have to admit the stain scares me a bit so I may just do without. Your counters came out great! Your counters look fabulous. 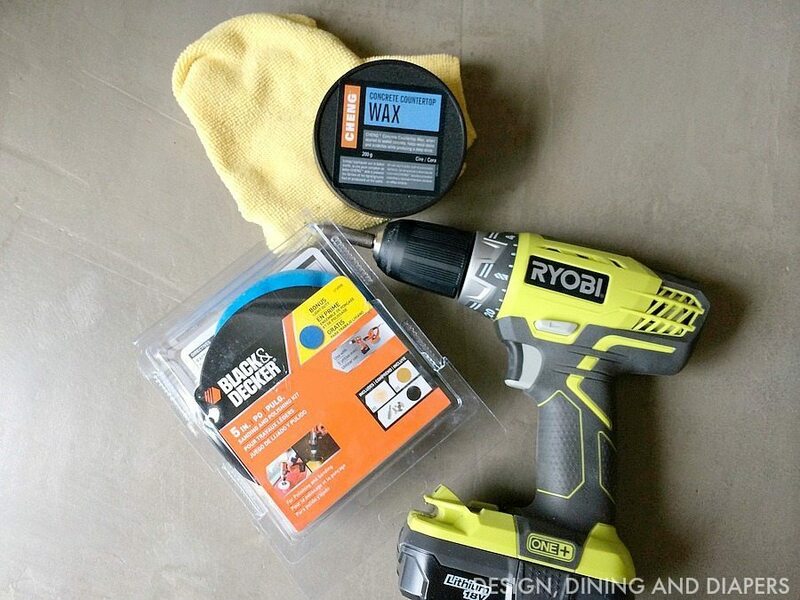 Instead of leaving the counters so rough in the final step, you might be able to eliminate some dust and sanding by using a trick I use when I am patching dry wall or sparkling. Use a small sponge with very tight texture. Think latex foam or the type of foam in a magic eraser. DO NOT USE A MAGIC ERASER. With a light touch and wet sponge, you can get a smooth surface when spackling. It might also work with this chemical mix. After doing tons of research, I wanted to say your tutorial was my favorite and I referred back to it many times! I just completed my powder room and the only part I had a hard time with was one corner edge kept showing the countertop after sanding. I haven’t sealed yet. Any problems with this sealer showing soap marks around the sink like your bathrooms? How are they holding up? I got the wax and buffing kit you recommended too. Great suggestion, since car buffers are expensive and that wax recommends that. Thanks again! I’m so glad it helped you! If you use the acrylic sealer you won’t have any issues with the soap marks, at least I didn’t in the 6 months I had them. We actually sold this house and moved this summer. Having a hard time finding the satin… would you use a gloss or too much shine? 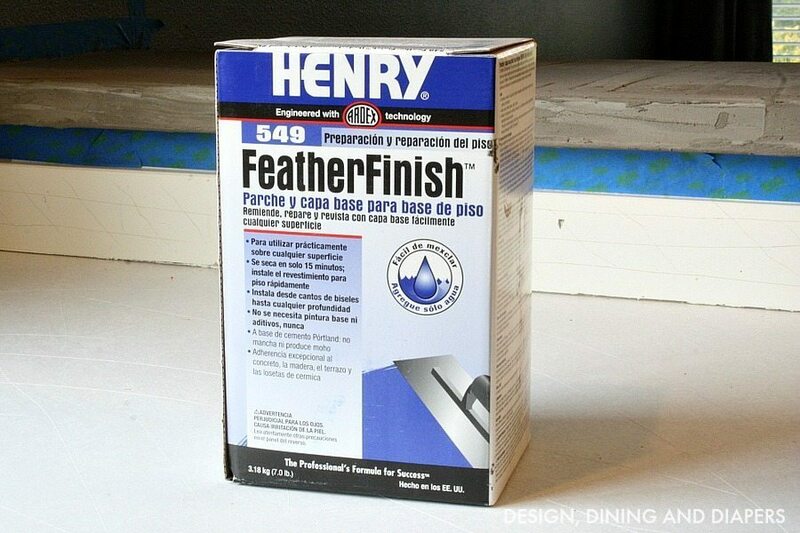 So we just finished laying the Henry/Ardex feather finish over our 80s laminate countertops. It has turned out really great. The sanding was difficult, but well worth it. We just put on a coat of water-based acrylic sealer. Do you have any tips on how long you waited in between coats? This is great, I have been doing so much research. My girlfriend just finished her kitchen countertops with a purchased kit. Her kit did not have a wax step. Can you tell me the purpose and necessity of waxing after sealing. Thank you! Any suggestions for countertops with the raised rounded edge (drip edge) as the counter tops is not level? Would removing the counter top to the plywood be the key to success? What was the apx. running linear measurement of your counter surface? Hi Linda! I’m not a true expert, but the cement is really moldable, so you could easily work it on the raised edge. I carefully molded it around the back splash area and then you carefully hand sand in those little places. I am not sure if plywood would work. Hi! 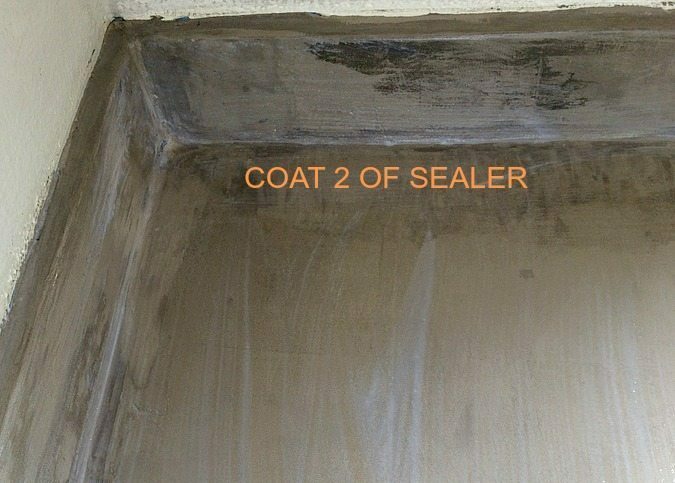 Just curious how the countertops are holding up after all this time, and if you’re still happy with your sealer/wax combo. I’ve noticed some people use wax and others don’t…what’s the benefit of using wax? Thank you! Were you disappointed with the outcome? I was told this was an option for my existing countertops, I’ve seen several DIY blogs and yours turned out the best, still depressing based on the pictures. I may do granite tile instead. This tutorial was awesome! Thanks Taryn! The hardest part for me were the edges. I could not get them to round out like yours, but small complaint. I really like the overall look. I did have a heck of a time finding a good sealer (without having to order online). After much trial and error I found this product at Sherwin Williams : H&C® Concrete Sealer Wet Look Water-Based. It is perfect. Thanks again. I love how these counters turned out and I want to do them so bad! I was just wondering that it looks like you put all of your layers on without sanding in between? It seems like it would be quicker in a way to do it like that. I know there is still lots of sanding in the end but each layer should smooth it out without sanding right? I just want to get it right the first time. :) Also I am wondering how it is holding up? If I did it again I would probably sand the really rough parts down in between each layer, but I would save the majority of the sanding for the end. We only lived in that house for about 6 months after I finished the countertops (sorta bummed about that), but in the 6 months we were there they held up great. You just have to be careful about oil on them, it will stain if left on too long. I would normally just put towels down around the stove if I was using hot oil for anything. I was checking to see if you sanded between each layer or if you waited until the end and sanded? This blog/tutorial inspired me!!!! I’m taking 9 days off work to do a DIY kitchen facelift. I took your idea and am applying concrete to my horrible laminate countertops. I looked at tons of other blogs/tutorials but yours is the easiest to follow and you posted great before, during,and after photos. I colored my concrete and so far have one layer of concrete on. Fairly easy process and I’m so excited to see what mine look like when they are done. Thanks for the great tutorial! 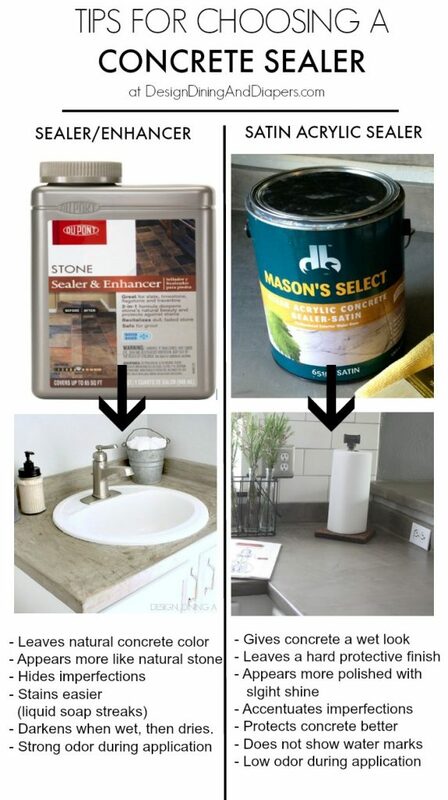 I really enjoyed reading your post on Faux Concrete countertops and the comments that you received. I am in South Africa and I am not familiar with the products that you used for your project but well done! I am the owner of a company called Wolkberg Casting Studios- we have developed a non-porous “concrete material and we supply ready to install “concrete ” Counter tops. I say “concrete” in inverted commas as the material development has taken more than 3 years to reach the std of the likes of granite and Quartz. Ready to install meaning it comes in slabs and is sold per square meter, I believe for you kitchen size, our plug and play system will come in around the same price as your DIY project perhaps even less as there is minimal work for you. Hopefully I will be able to bring our product to your country soon. Hi there! 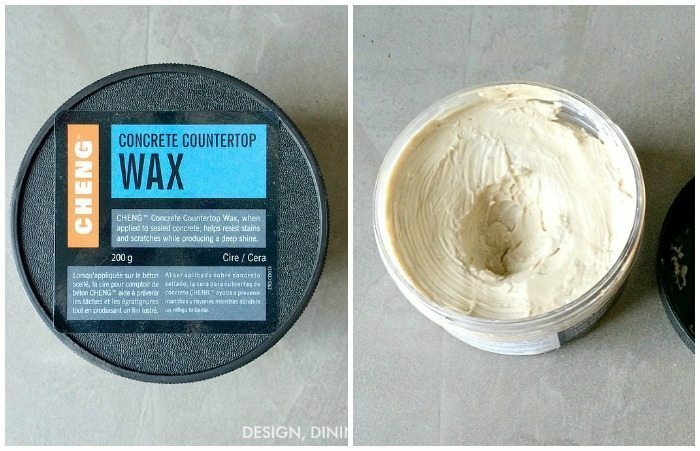 This is one of the best tutorials I’ve read on DIYing faux concrete counter tops! Love it…. I was wondering how they’ve held up? I think we consider it a temporary fix, but I’d like to know just how temporary. Hi Whitney! Glad you found the tutorial helpful. I actually don’t live in that house anymore, we moved about 6 months after we finished the countertops. During the time I lived with them I think they were pretty sturdy. The only thing I noticed is that they do stain from oil spills. So I would put towels down around the stove. You can also touch up the concrete by sanding down the sealer and than applying more concrete. I have friends who have also done them, and they have held up great over the past few years. Your project turned out beautifully! I’m in the process of doing my countertops- just wondering how many layers of the Ardex you used? I’m on my second coat- sanding between coats. Not sure if I should go for three coats or not. I am thinking about doing concrete countertops in our kitchen. How are these holding up? I have heard that these chip easily when you cover your laminate countertops with concrete -any thoughts? Does the concrete chip during everyday use? No it didn’t! I don’t live in the house anymore. But I never had a problem with them chipping. Nice work, and I am just experimenting with this system a little. Your info on sealers will help. I was wondering how long ago you did this and just how tough the stuff really is – does it dent or chip easily? Are your countertops still looking amazing? Hi John, I actually don’t live in the house anymore, but… I had the bathroom counter done for about a year before we moved and it held up perfectly. No issues at all. with team kitchen, I made the mistake Not taking out the appliances when I did the counters and just worked around them. So when we took them out to replace them, the counter cracked a little in places that were stuck to the appliances. With this technique, it’s really easy to patch. So it wasn’t an issue. I just went over the place and resanded and sealed. Do you know if you can use Buddy Rhodes Reactive Polyuerthane Sealer on this type application? 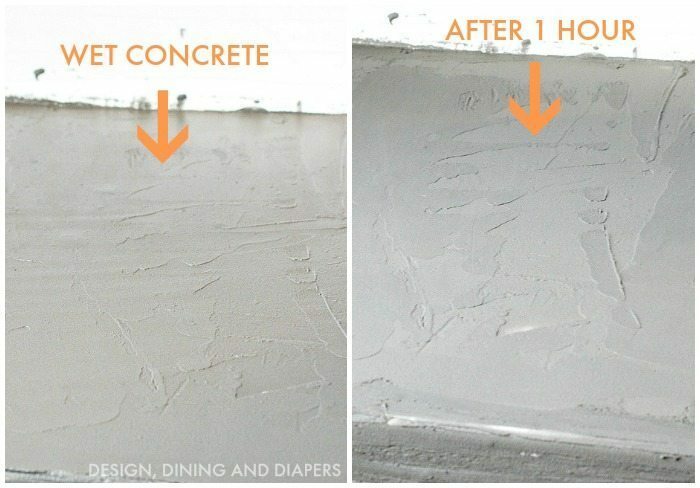 I read that it is the BEST for POURED Concrete counters but wasn’t sure if anyone else had heard of it. I’m really interested in doing this in my kitchen. Can I go over existing tile countertops? I also would like to stain the concrete to match my decor. Any suggestions? Great job, 1 question plz. I have formica countertops and they have a rounded edge in the front, how do you square that up or can you? Thank you! Oh, & can you stain them a different color???? Do you know if this would work over butcher block (what we have now)? You’re probably so sick of answering questions from this post two years later, but do you think it would be possible to seal them first with the Dupont Stone Enahncer, then add a layer of the acrylic sealer to add durability? I like the look of the Dupont best, brutal so love what you have to say about the stain protection of the acrylic. I’m wondering if I add the acrylic after completing the process with the enhancer, if it would keep the more natural stone look (and not darken). Thanks! Hi! I don’t know how the two sealers would bind together (that’s an area I’m not an expert in) but I suppose you could!